What is the Brux Night Guard? The Brux Night Guard is a small mouth guard worn at night while you sleep that protects your teeth from grinding and clenching. Why is it called "Brux?" Brux is short for "Bruxism," which is a condition that affects nearly 40 million people in the U.S., including children and adults. Bruxism is the medical term for clenching or grinding teeth either at night or during the day. What causes Bruxism (teeth grinding and clenching)? Bruxism is one of the most common sleep disorders, although it also occurs during the day. It is a habit frequently caused by stress or anxiety. It can also be caused by an abnormality in the mouth such as a recently chipped or missing tooth. Can Brux be worn during the day? Yes, it is effective at any time of the day or night, although most people will wear it at night when they can't consciously monitor or stop the problem. Will the Brux Night Guard completely stop clenching or grinding? It will probably not stop clenching or grinding for most people. Rather, it is designed to save the teeth from unusual wear or chipping caused by grinding and clenching and relieve symptoms caused by night time clenching and grinding. For some people, it may make the habit of clenching and grinding on the mouth guard more recognizable so they stop the habit. Does it have to be worn every night? Many teeth grinders only have periodic problems or flare-ups when they grind, especially during stressful times. During these times, they often wake up in the morning the next day with a sore jaw from clenching or grinding during the previous night. These are the most important times to wear it to save the teeth. Why doesn't the Brux Night Guard go all the way back to cover the molars where many people clench? It's true that many people clench and grind their back teeth, molars, and even wisdom teeth. The unique design of the Brux Night Guard places the emphasis of the bite on the front teeth, which relieves stress on the back teeth and jaw. It also provides a lower profile in the mouth than full-sized mouth guards and because of this, it's more comfortable to wear for hours while sleeping. Does it help with TMJ? TMJ stands for "Temporomandibular Joint Disorder" with symptoms including pain in the jaw, the temporomandibular joints, around the ear, and pain while chewing. Because the Brux Night Guard is worn on the front teeth, it decreases the impact and stress of clenching and grinding on the back teeth and jaw. Many people have said it greatly reduced their TMJ symptoms. What makes Brux better than mouth guards from a dentist? The biggest reason Brux is better than night guards from a dentist is the price. Most dental night guards cost approximately $600. That cost is out-of-pocket and almost never covered by insurance. At $60, the Brux Night Guard is one-tenth of the cost of what a dentist would charge. It only comes in one size? Will it fit my teeth? Most people have similar sized mouths but they can have dramatically different teeth sizes and patterns. The Brux Night Guard is moldable at home in boiling water to ensure a proper fit with each person's teeth and wear patterns. I've never worn a mouth guard at night. Will it be uncomfortable? Most people report it's a weird feeling to sleep with a mouth guard at first and some even describe it as uncomfortable and difficult. Like anything new, it will probably take some time to get used to, but it is worth it to give it some time. If you've ever worn eyeglasses or contact lenses for the first time, you'll understand. New eyeglasses and contact wearers frequently have itchy eyes, headaches or pain on the bridge of the nose.Over time, the wearer usually adjusts in the span of several days or weeks, and after they become comfortable with the new devices, they accomplish their goal of better eyesight. How do I store and clean the Brux Night Guard when not in use? Where is the Brux Night Guard made? We're proud to say the Brux Night Guard is made in the USA and not overseas like many other mouth guards. Can Brux be worn by children? The current version of Brux Night Guard is designed for young adults and mature adults who have all of their permanent teeth. Because there are so many different variables for children, such as smaller teeth, gaps from adult teeth that haven't come in yet, and other factors, we don't recommend the current version for children under 18. We are considering a youth version in the future after we have more research information. What is Brux made of? Are the materials safe? Brux is made from food grade materials that are non-toxic and safe for use as an oral appliance. We spent a long time researching materials that would be safe and non-toxic. Brux is FDA cleared and successfully passed all federal biocompatibility tests for cytotoxicity, sensitization, and irritation. Can Brux Night Guard be worn with braces, dentures, etc.? Brux Night Guard should NOT be used if you have missing teeth or wear braces, caps, implants, dentures, retainers or other external surface devices. Brux needs to remain firmly in place while sleeping and should not be used if any teeth issues prevent this from happening. Will Brux work if I have an overbite or underbite? Bite problems are known as Malocclusions and the two most common types are overbite and underbite. We specifically designed the Brux Night Guard with bite protrusions to accommodate people with an overbite or underbite. Regardless of which type you may have, it will be effective for protecting the teeth from grinding and clenching if worn on either the top or bottom teeth. Do you have any tips for molding Brux? You should have a snug fit after molding Brux and it should stay put when you open your mouth. It really helps to use your fingers and thumbs to squeeze the guard around the front and back sides of your teeth. Below is a quick instruction sheet that shows where to squeeze. The first time you mold your Brux it might not be snug, so immediately boil again and squeeze with your fingers and thumbs around the front and back. 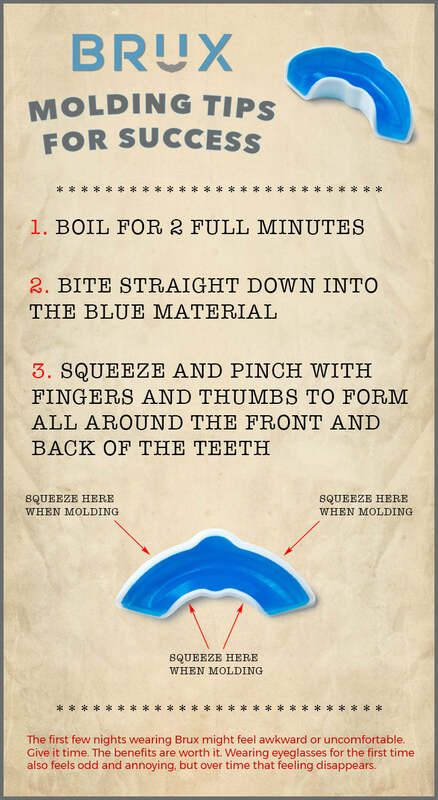 Keep it in for a minute during molding. This will result in a snug fit and it will not fall out. Is Brux Night Guard FDA Cleared? Yes, Brux is FDA Cleared and passed all biocompatibility tests for cytotoxicity, sensitization, and irritation.